Comet Arend-Roland was taken by Alan McClure on April 24, 1957 and presented to the members of SRO at a meeting the next night. This image clearly shows the rare anti-tail, or sun-pointing tail feature of this comet. 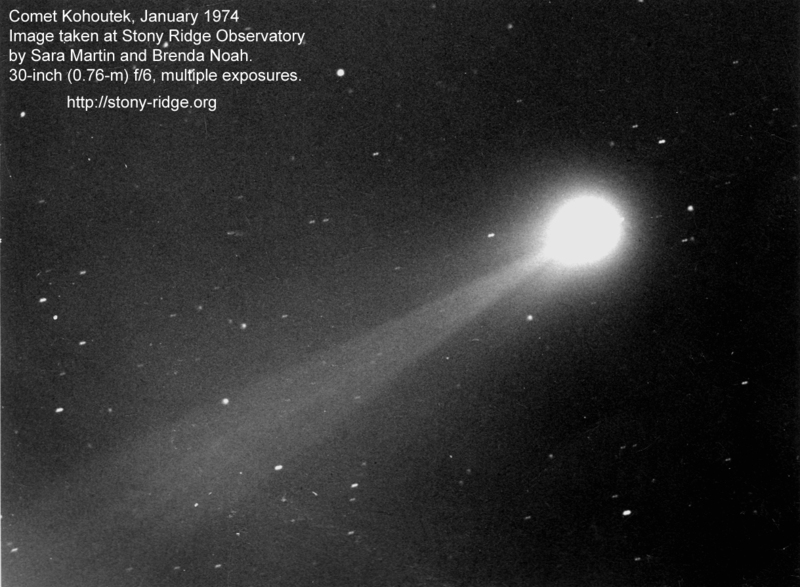 Anti-tails have been produced by only a few comets in history, some being C/Arend-Roland (1957), C/Hale-Bopp(1995), C/Kohoutek (1973). The anti-tail is not actually pointing toward the Sun, but is a projection effect of dust in the comet's orbital path. The dust in the path behind the comet becomes visible when the comet's orbit lies in the same plane as the Earth's. 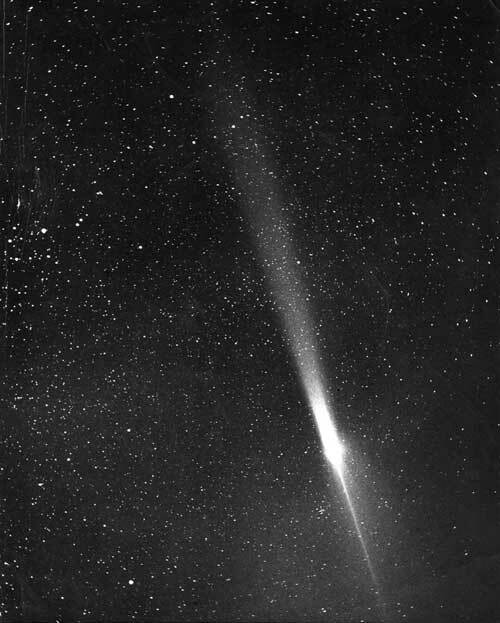 Comet Mrkos (above) was photographed by Alan McClure on August 13, 1957 (apparently a great year for comets). 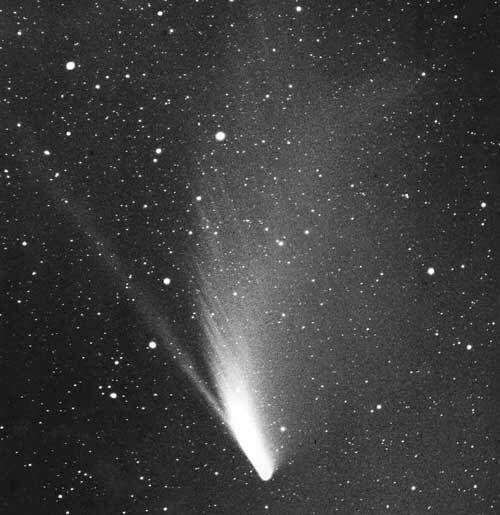 This picture clearly shows two types of cometary tails, the straight ion tail, and the curved dust tail. Both tails point away from the Sun. The straight ion tail is formed from charged particles that are highly accelerated by the Sun's solar wind. The curved trail is caused by dust-sized particles being blown off the surface of the comet by the radiation pressure of sunlight. Comet Mrkos's orbit did not lie in the plan of Earth's orbit, so an anti-tail, as seen from C/Arend-Roland was not present. The well known amateur astronomer and comet photographer, Alan McClure (1929-2005) was a member of Stony Ridge Observatory for a short time, serving on the SRO Executive Committee as an Expediter during the planning and construction phases between 1957 and 1959. Alan's comet photography has been widely published in scientific papers and texts, and on magazine covers (Sky & Telescope). A number of his photographs were also published in the 3-volume classic Burnham's Celestial Handbook. Orphaned at the age of seventeen, Alan inherited a sizable family fortune that allowed the teenager to not worry about the need of getting a job for the rest of his life. He took that opportunity to inspire a generation of devotees to astro-photography world wide, including a number of us old-timers at Stony Ridge Observatory. After his death in 2005, Alan's entire remaining estate, which included his Pasadena condominium, was donated to the International Dark-Sky Association (IDA). This writer was privileged to have known Alan before I knew of the existence of Stony Ridge Observatory. I was a sales associate at Lee-mac Camera Exchange in Pasadena, California (2 blocks north of McClure's residence). During the 70's and early 80's Alan would stop by the store to gab, often several times a week. Favorite topics of discussion were astro-photography, Celestron telescopes and Leica cameras (which we sold at Lee-Mac), and Rolex watches (which we didn't). 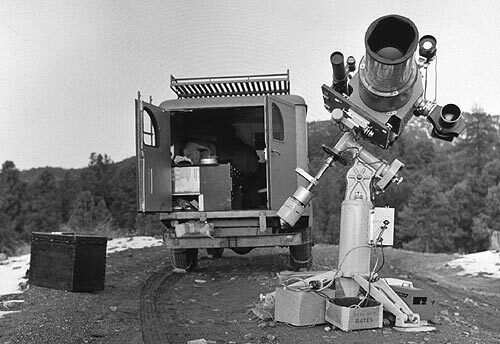 The above photo of Alan McClure's astro-photography setup is courtesy of SRO member, and current Chair of the SRO Telescope [restoration] Committee, John E. Rogers, who attributes his early astronomy interests to Alan. John obtained it from an auction of Alan's estate. Note the George Carroll mount. The image left (courtesy of Dennis di Cicco) shows Alan McClure with a different optical setup, but the same Carroll mount. There is yet another optical system shown on a photo in Henry Paul's Outer Space Photography, Fourth edition, American Photographic Book Publishing Co. (AMPHOTO), 1979, page 22 that was taken by SRO's optical engineer Roy Ensign showing the same, durable, high quality Carroll mount. Through the years Alan had accumulated a menagerie of optical components that he trusted to the Carroll mount. In 2004 during Stony Ridge's Faint Object Follow Up (FOFU) project, an unknown asteroid was discovered on CCD images and reported to the Minor Planet Center (MPC). The MPC returned the temporary designation 2004 RR289 for this object, making it officially a newly discovered asteroid. To get a number to replace the temporary designation, the object has to be observed for over three revolutions around the Sun. New discoveries, therefore, require follow up observations to increase the time between first and last observations (called the arc). When an object has a sufficient arc, it receives a number from the MPC. Numbered objects can then be given a name by the original discoverers. To increase the arc for 2004 RR289 an effort to recover the object was initiated in 2009 by FOFU's Steve Brewster. The SRO 30-inch telescope was undergoing restoration in 2009 and not available for any recovery imaging at SRO. Using observation tools provided at the MPC and projecting the orbit parameters of RR289 to 2009, he was able to locate areas of the sky that were being imaged from surveys being conducted at other observatories that may include the return of 2004 RR289. It became apparent to him that 2004 RR289 would have had to have been imaged at one professional observatory. Steve then got FOFU's John E. Rogers involved in the effort since John was highly skilled in the math used in calculating asteroid orbital dynamics. John downloaded all the new observations from survey telescopes from the MPC and using his own software calculated the orbital elements from those observations. He then was able to make a possible orbital link to the newly discovered object 2009 UH4. The possible link was reported to the MPC and they agreed that indeed 2004 RR289 and 2009 UH4 were the same object. With a 5-year arc, a very accurate orbit was determined and linked into a search of an MPC database of short arc observations, referred to as ONS or one night stands. Thus many observations from decades prior added to the arc. The object received a number (327030) from the MPC and Stony Ridge received the credit for principal discovery.